Melissa Shearer, PA-C, graduated from Texas A&M University and then received her Master of Physician Assistant Studies from the University of Texas Health Science Center at San Antonio. Melissa has over 9 years of dermatology experience, and she is passionate about preventing and treating skin cancer after her personal experience with melanoma. In addition, she enjoys treating patients of all ages and helping them with a variety of skin conditions including acne, warts, eczema, psoriasis, and rashes. 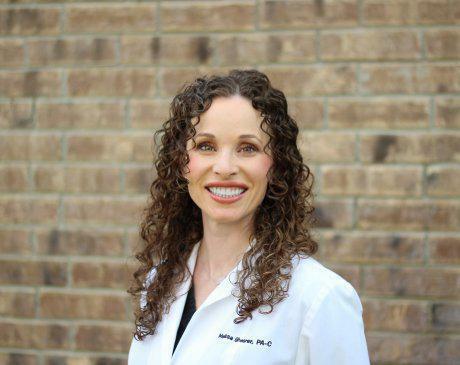 Melissa is certified by the National Commission on Certification of Physician Assistants and licensed as a physician assistant by the Texas Medical Board. She is recognized as a diplomate of the Society of Dermatology Physician Assistants and is a member of the American Academy of Physician Assistants. Melissa has been married for over 12 years to her husband Ryan, and they have 3 handsome boys. She enjoys spending time with her family, playing games with her boys, running, cooking, and being involved with her church. We are contracted with a great variety of PPO insurances. We are continually working to get credentialed with additional policies. If you do not see your insurance company listed, please call our office to inquire about your specific plan.